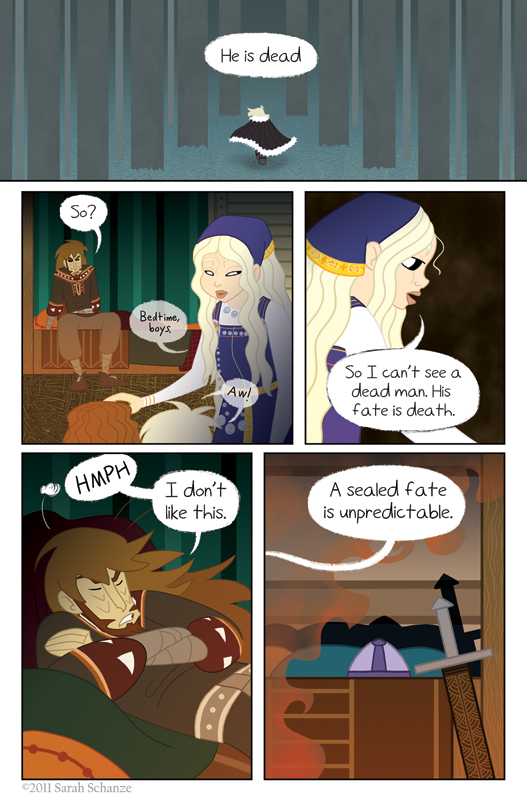 “A sealed fate is unpredictable” – that is a very interesting way of looking at it. Very much enjoying this comic! i guess loki wants to be the only unpredictable one. I love the Grumpy Loki face. xD He’s like: why don’t you know!? Sigyn: Dear, I’d like you to take care of two boys, a longhouse and surrounding land, all on your own, still make dinner, AND know the future of random dead youths that the proverbial cat drags in and dumps in an angsty heap on the doorstep. I’m just twitching though: Coal left his helm and sword! D: You don’t just leave those around for someone *coughMasterThiefcough* to swipe or do something weird to them like change them into noodles. Ooooo, I really can’t wait to see all the stuff in the sneak preview panel! A net? Coal swiped Loki’s invention! 😛 Andandand that CHAIR. It has ARMS and even a BACK! That is so a rich man’s chair. No details so no way to know if it was stolen or not… And Coal looking like he was just scolded for something he did, slinking down in it… SUSPENSE! And that first panel! It looks so great! Even though it's super simple, I can get such movement from it's design and placement and all that…. and the depth with the trees and… yeah. I love it. Hm… don’t like this page. Too much that could be said with different tones or inflections or just interpreted differently. I can understand cryptic foreshadowing or vague prophesies… but the setup for this just doesn’t seem to work. Maybe if I knew a bit more about Norse mythology it might make more sense… but all I recall about Loki’s wife is that she caught the poison that dripped down at him from the Midgard serpent when the other gods bound him. Thanks very much for your honest comment. You’re right about Sigyn, that’s pretty much all the myths ever say about her. But having been Loki’s wife I wanted to explore her character a bit more, so she’s developed in ways no one can really know, even if they knew all the myths. This page might be more cryptic than I realized, and I apologize for that, but I hope you’ll keep reading. Eventually it will make sense, I promise! Well, at least I hope. Thanks again! Heh heh. It’s funny because it’s ironic.